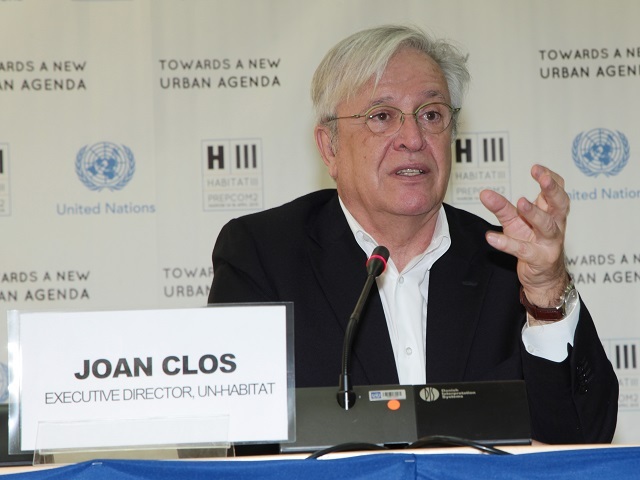 UN-Habitat Executive Director Dr. Joan Clos addresses a joint press conference during PrepCom2–a meeting in Nairobi, Kenya for international leaders to prepare for next year’s Habitat III. Photo by UN-Habitat/Flickr. In 1950, fewer than 800 million people lived in urban areas. Today that number is almost 5 billion, and is expected to surpass 6 billion by 2045, according to the UN World Urbanization Prospects. Urban growth—and its related challenges of poverty, climate change, resilience, and consumption—is the defining issue of our time. Global processes are underway to address these challenges. From the forthcoming UN Sustainable Development Goals (SDGs), to this summer’s International Conference on Financing for Development, to the COP21 climate negotiations in December, global and local leaders will be busy this year making commitments to build a more sustainable, equitable future. For cities, this all culminates in 2016’s Habitat III conference on cities and human settlements, to be held in Quito, Ecuador next October. To prepare for this pivotal gathering, local, national and international leaders have come together this week in Nairobi, Kenya at Habitat III’s second Preparatory Committee. They’ll set priorities for urban development that will shape city actions for decades to come. Following Habitat II—hosted by Istanbul in 1996—the UN-HABITAT recommended that each country form National Habitat Committees by June 2014. These committees were to assess progress since 1996 and create recommendations for a new urban agenda to be established at Habitat III. National Habitat Committees have taken stock of countrywide progress and opportunities, but have yet to identify how these lessons can help cities become more connected, compact and coordinated. National governments can take this moment to better understand their own unique challenges and work with city leaders to develop a common agenda. Additionally, more than 50 cities have already committed to the Compact of Mayors—with more to come—and will take action to measure, report, and reduce their carbon emissions. Habitat III could be an ideal platform for these cities to commit to specific reduction actions. Between the SDGs, COP, and Habitat processes, there are many ways cities can advocate for progressive and sustainable national urban development policies. City governments have an essential role in this process as leading drivers of climate action, but national bodies need to help cities succeed and develop good practices. City actors should seek out opportunities to work with their national governments and with development banks to localize national initiatives. For example, India’s 100 smart cities initiative is a plan from Prime Minister Narendra Modi to take advantage of the country’s recent urban boom and catalyze investment in Indian cities. Cities can also look to leverage international funding commitments, like the $175 billion committed to sustainable transport projects by the eight largest development banks in 2012. Global and national commitments must be linked to the real solutions cities need. Municipal governments, city networks, business leaders, local NGOs and other stakeholders can help national and global leaders take into account the challenges cities face in developing sustainably. This helps to ensure that investments and commitments come back to individual citizens and improve quality of life. Between the Green Climate Fund, the aforementioned Financing for Development conference and other international financing processes, the framework for investment in sustainable development is complex. Rather than layering on top of this complexity, this year’s conversations should inspire a transformational and collaborative investment framework that increases the size of the pie, incorporates the different financing mechanisms that exist, and enables cities to move towards a low-carbon development pathway. Pushing for a better framework also means creating an enabling environment that builds capacity for cities to access these funds and leverage private sector investment. Cities can use this historic moment to advocate for and exemplify the fundamental changes needed. By putting into practice the principles of tomorrow’s sustainable and resilient cities, urban leaders can steer the agenda by leading through example. The opportunity for innovation is ripe. As national decision-makers craft climate action commitments and sustainability goals, they should remember that 75 percent of the infrastructure that will exist in 2050 has not yet been built. Local leaders have the chance now to build cities that lower environmental impacts and serve urban populations more equitably. Habitat III represents a chance to make national and international commitments—like those from the Lima and Paris climate talks—real. By linking these global movements with local actions, cities can reclaim the power they need to create the change we want.